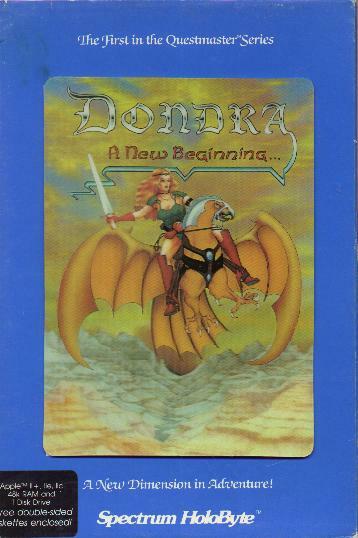 A fantasy adventure by Spectrum Holobyte, Dondra: A New Beginning was the first in a planned series, but the only one to ever see the fluorescent light of software stores. It featured cartoon graphics, 3-D scenery and a number of animated cut-scenes. But it's best known among collectors for the color hologram that adorns the box's slipcover. This is the exact same game as Miles Computing's Questmaster: The Prism of Heheutotol. I've had the two games for months now, and never realized this. Thanks to Aaron Willis for pointing it out. For a full history of the game, character descriptions, and a complete walkthrough, check out Aaron's Dondra home page.